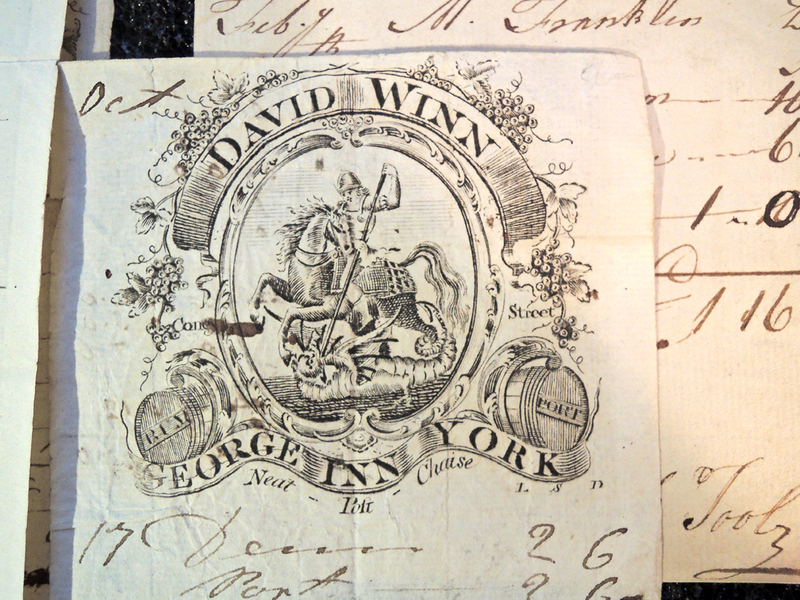 Princeton’s Graphic Arts Collection holds a lovely collection of colorful printed menus from the nineteenth and twentieth centuries (https://graphicarts.princeton.edu/2016/06/01/decorative-menus/), along with a substantial collection of engraved change packets from nineteenth-century British shops (https://blogs.princeton.edu/graphicarts/2012/04/change_packets.html). 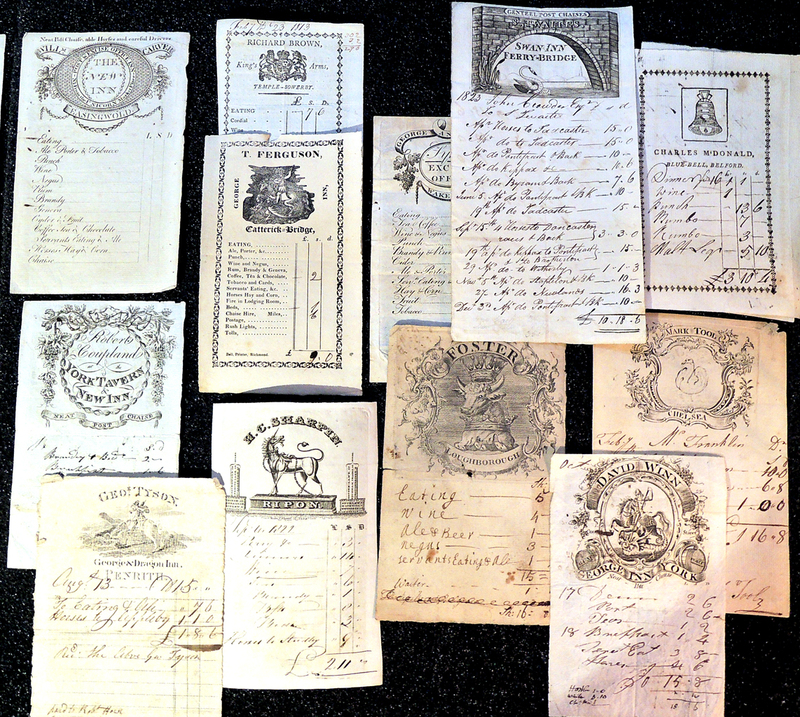 Adding to this wealth, we recently acquired a group of 20 printed and handwritten bills from inns dating 1780 to 1830. 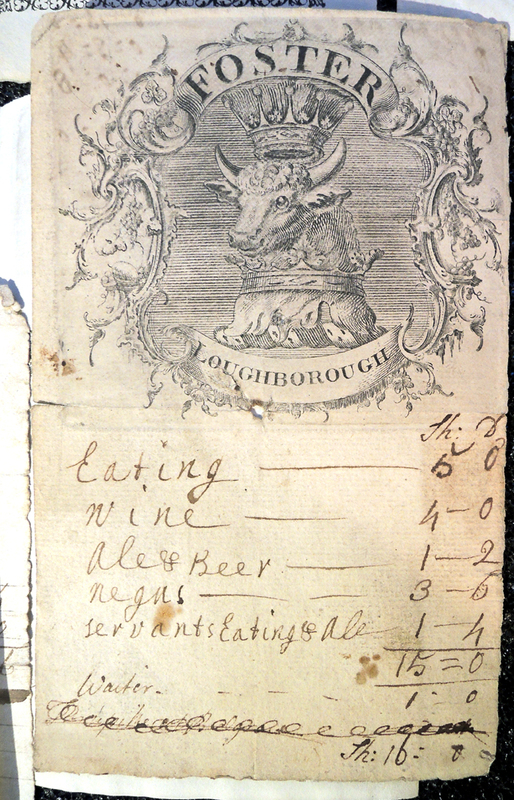 The businesses include: Foster, Loughborough [c.1780]; Charles McDonald, Blue-Bell, Belford ; Charles McDonald, Belford ; Mark Tool, Chelsea [c.1790]; Charles McDonald, Belford ; George Nelson, Queen’s Head, Morpeth ; Robert Coupland at the York Tavern & New Inn ; David Winn, George Inn, York ; Willm. Carver, The New Inn Easingwold ; Richard Brown, King’s Arms, Temple-Sowerby, [printed by] John Ware, printer, Whitehaven ; John Barnes, Lion and Lamb Inn, Carlile [printed by] Jollie, printer, Carlisle [c.1815]; Geo.r. 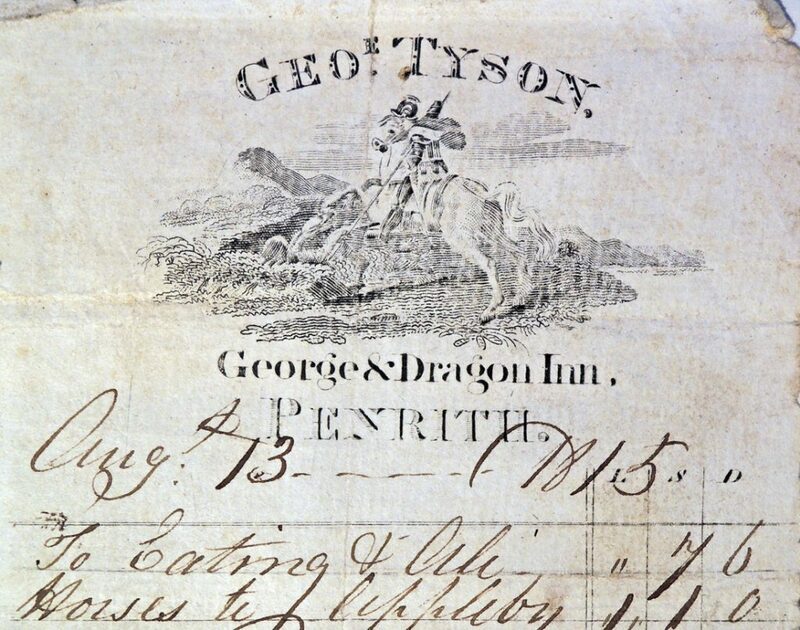 Tyson, George & Dragon Inn, Penrith. ; J. Broadbent, White Bear Inn, Barnsely. 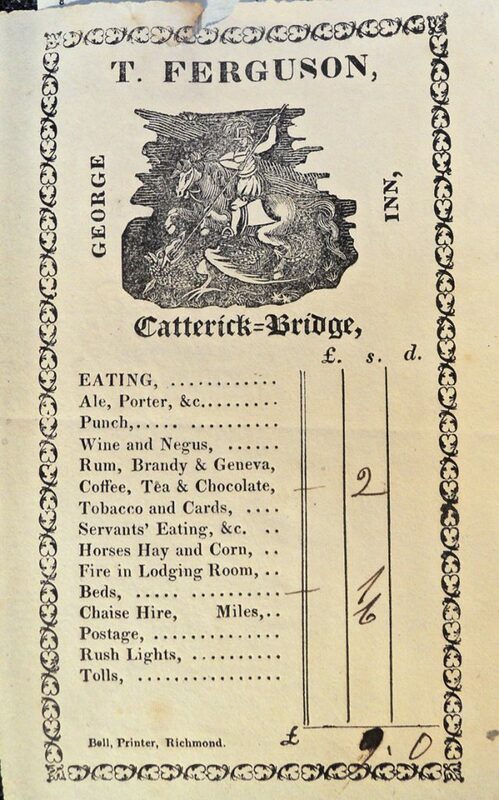 [c.1818]; George and Dragon, Sykes, Wakefield [c.1820]; H.C. Sharpin, Ripon ; S. Twaite’s, Swan Inn Ferry-Bridge ; Salkeld’s, Green Dragon, Workington. ; Harrison, King’s Head Inn Barnard Castle. ; T. Ferguson, George Inn, Catterick-Bridge [c.1825]; Matthew Bell, Fish Inn, Penrith. .
Not only are the letterhead engravings of interest as printed ephemera but these records of food, drink, and other services offered to travelers at the end of the Georgian era are of value to researchers in many disciplines. 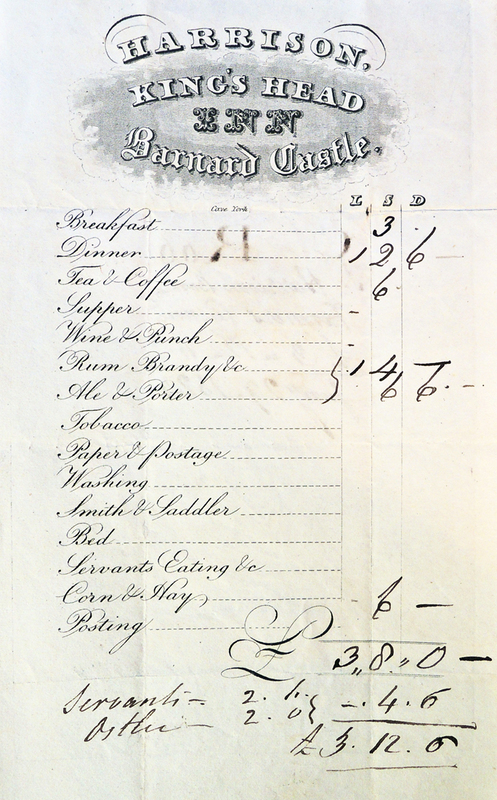 It is curious that the bills are often pre-printed with a list of drinks and services. The waiter simply checked off what each patron ordered and added up the total. Note the food for the horses and servants is included on each bill along with tobacco and postage. This entry was posted in Acquisitions, Ephemera on November 28, 2016 by Julie Mellby.